I’m trying to figure out a way to do at least a little fieldwork at Walakpa this summer. I’ve got a proposal in for major fieldwork (3 field seasons) but decisions aren’t made yet, and even if it is successful, fieldwork couldn’t start until next summer. That’ll be great, but there is a remote possibility that we could have another storm as big as the one that took over 11 meters of the deeply stratified deposits last Labor Day weekend. Sites like Walakpa, with deep, frozen layers with good organic preservation can be seen as a special type of Distributed Long-term Ecological Observing Network of the Past. In addition to the artifacts and structures left by past humans, these sites contain residues of human subsistence activities, in the form of stratified layers, often several meters deep and spanning millennia, of the remains of animals and plants gathered from the surrounding area. These remains are samples from past ecosystems that cannot be replicated, absent the invention of a working time machine. A column sample from such a site is similar to an ice cores or a lake or bog core, with the addition of samples from a wider area. It can tell us all sorts of things about the environment through time when analyzed with the right methods. Information about how environmental change affected important subsistence species would be incredibly useful for those attempting to manage such species in today’s changing environment, and thus important to the food security of Northern residents. Unlike ice cores, there is no elaborate infrastructure set up to collect and preserve such samples. We really want to get a column sample from top to bottom of the site, just in case the worst happens. 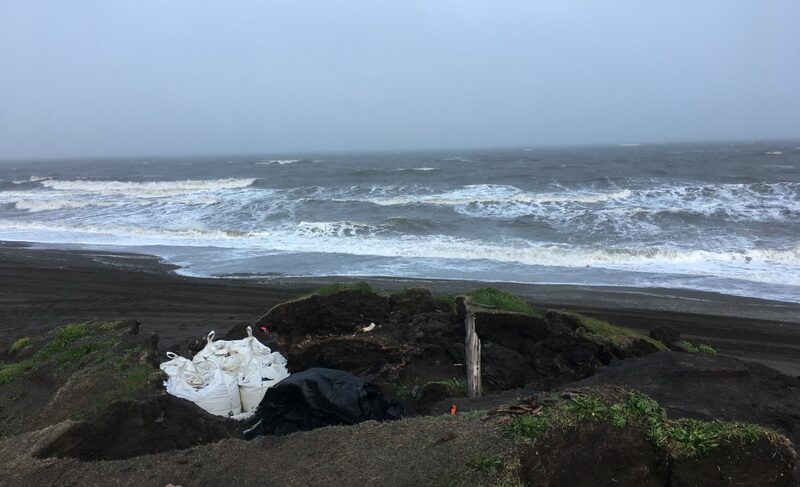 It will only take a small crew, and maybe a week or so, since the bluff should be thawing in from the side as well as from the top, making excavation faster. It looked like maybe it would be possible for the North Slope Borough Department of Iñupiat History, Language and Culture to run a camp there, which would have let students be involved. I was writing a grant application to try for support for food, fuel and transportation to the site for that camp. On Friday, we learned there was a conflict, so now I am trying to figure out another approach. It is looking like it may need to be a volunteer effort, since most quick turn around funding sources don’t pay salary :-(. If anyone has any ideas, or might be willing to volunteer to help out (digging, loaning camping gear, moving stuff to or from the site, camp cook, basic lab work afterwards), or would be interested in analyzing data from the site, please let me know. This site is really important both a a part of Iñupiat Heritage and a source of long-term environemtal data.